The 8STA Series includes many high density, space saving connectors designed to perform under all autosport conditions. 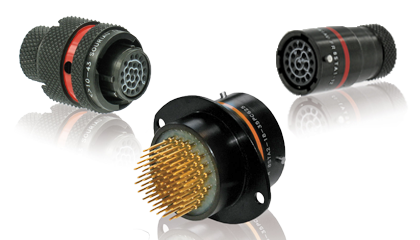 From quick release steering boss connector systems and connectors that can incorporate up to 128 contacts, the series also features products that help connect systems in hard to reach areas. 8STA size 08 – 24 connectors incorporate up to 128 contacts for really high density autosport applications such as engine control, data acquisition and cable harnesses. Available in 5 shell styles, EMI-RFI shielding and shell to shell continuity is provided by conductive plating and an integral grounding ring. Designed by Souriau as a compact solution for motorsport engine control units, data acquisition systems and cable harnesses, the 8STA high density connector comes in 7 shell sizes and features size 26 contacts for 24 to 30 AWG cable. Designed to offer motorsport a host of weight, cost and space saving benefits when connecting engine control systems etc, this 8STA in-line receptacle allows easy fixing and easy cable routing in tight spaces. Cable identification is made simple with colour coded bands. These 8STA variants are designed for high density engine control and data acquisition applications throughout autosport. Available in 12 shell sizes – 02 to 24, 8STA PCB connectors use Souriau’s extensive range of 38999 medium and high density signal contact layouts. Access to engine control and data acquisition systems is not always straightforward and this blind mating plug is a solution for hard to reach areas. These 8STA plugs are available in sizes 10, 12, 14 & 16 and allow for misalignment in three axes – axial, angular and longitudinal. The latest motorsport steering boss systems demand quick release and this 8STA connector variant provides a reliable and robust solution. Available in 2 shell sizes, these IP67 rated connectors are good for 500 mating/unmating operations and resist high levels of shock and vibration. Another time and weight saving product in the Souriau 8STA series is this integrated clinch nut. Designed to eliminate nut plates, thus making assembly easier, it is available in 12 shell sizes from 02 to 24 for standard crimp and PCB receptacles. Low profile circular connectors combine high performance with size and weight saving and are ideal for many motorsport applications. Based on MIL-DTL-38999 Series 2, 8TA connectors feature a rugged aluminium body, gold plated contacts and a positive locking mechanism with full environmental sealing.